A blog chronicling the trials and tribulations of the Philadelphia Phillies and other moderately interesting musings. 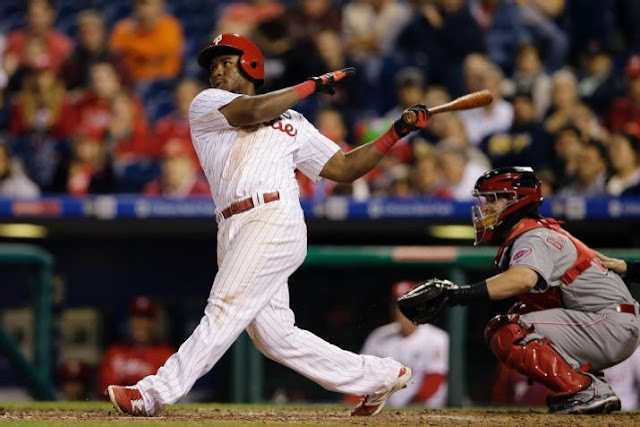 Maikel Franco has found his stroke. At the All-Star Break, the Phillies have played to a 42-48 record through 90 games. That performance is borderline remarkable considering several factors. First of which would be that the Phillies were picked to win 66.5 games. In fact they were picked to be the second worst team in all of the Major Leagues. That projected win total would be a .410 winning percentage and their current standing has them winning at a .467 clip and on pace to win about 76 games. Vegas is generally not off on these kind of predictions by that many games so these young Phillies are certainly over performing through more than half the season. Another noteworthy factor to the Phils’ pleasantly surprising season is the Jekyll and Hyde play of the ball club. Despite one of the worst run differentials in the Majors (runs scored vs runs allowed) this team came out of the gate winning at an unsustainable clip. On May 18th the Phils hit their high water mark of the season at 24-17 and they were right behind the Nationals for the division lead at the time. At one point, each of their prior 12 wins had come by a 1 run margin. This could not last, and it did not. After that brilliant first month and a half the Phils stingy pitching fell apart and their bats fell even more silent than they had been. In the next 32 games the Phils went 6-26 and looked every bit the worst team in the league that we all kind of expected them to be. 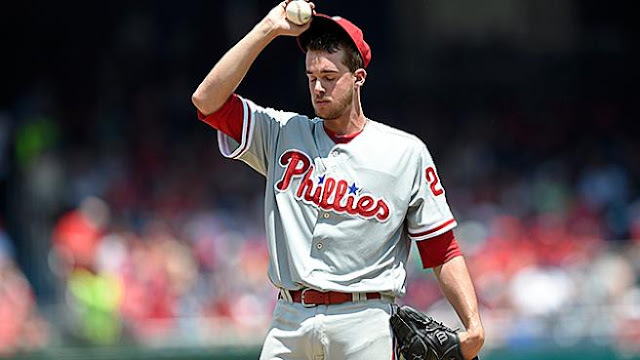 Aaron Nola fell apart. Vince Velasquez got hurt. The solid bullpen became a sieve and the bats are the bats, not very good. 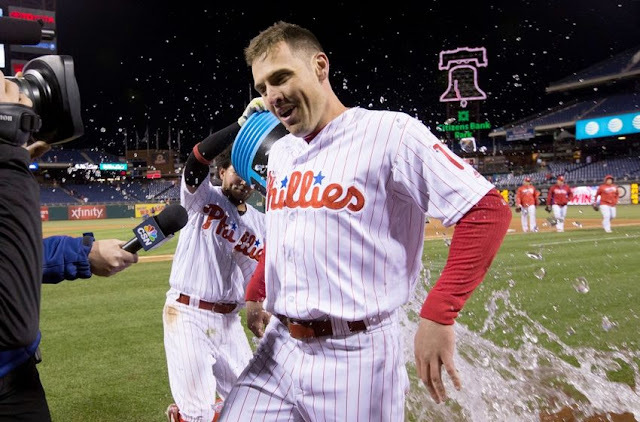 In those 32 games, which included 7 and 9 game losing streaks, the Phils were outscored 180-100 in total or 5.6 to 3.1 on average every night. The runs scored for the Phils were bolstered by some outlier games, they scored 8 twice and 10 once (in a game they lost!) so in the 32 games they scored 3 or less 21 times and 2 or less 17 times. Yikes. But then something seemed to happen to cause a spark in Minnesota. After dropping the first two games in the Twin Cities to fall to 30-43 on the season, the Phils finally found their offensive groove. I picture Pete Mackanin having a conversation with Ryan Howard like the one in this clip, Howard is in the role of Crash Davis. If he did, then it seemed to work. They won the getaway game in Minnesota and headed to San Francisco for the weekend where the Giants and their best record in the Majors awaited. The Giants may have taken two of three in that series but the two losses the Phils absorbed were hard fought including an 8-7 extra inning loss on Sunday that saw the Phightin’s make several comebacks and show real signs of life on offense for the first time all season really. With the confidence boost from playing the Giants tough, they rolled in to Arizona and returned the favor of a sweep to the Diamondbacks. From there they took two of three at home from the defending World Champ Kansas City Royals and followed that with a sweep of the hapless Braves. So how did they turn around a season that looked dead in the water? It’s simple really. They started hitting and they started hitting home runs. In the 17 games since the rough patch, Mackanin’s bunch has gone 12-5 and mashed 23 home runs. For perspective, the Phillies managed 66 home runs in their first 73 games. They are hitting nearly half a home run more per game during this latest stretch. Peter Bourjos has enjoyed some fairly unexpected success. The Phils have done it with a collective of contributions. Most surprisingly, outfielder Peter Bourjos has caught fire after not doing much of anything at the plate through the first two months of the season. In the last 30 days, Bourjos is tied for 2nd in the NL with a .397 batting average. The man he’s tied with? Cesar Hernandez. While Cesar and Bourjos have been doing it with a high average, Maikel Franco and Cameron Rupp have been doing it with power. Franco leads the team with 18 home runs, just a homer shy of top 10 in the NL and 3 shy of the top 5. Meanwhile, Rupp has come in to his own as the every day catcher replacing Carlos Ruiz. Rupp is hitting a stellar .287, has 9 home runs (5 in the last month) and is second among catchers in doubles (17) and third in slugging (.507). Maikel Franco has done a nice job of righting his ship after really looking helpless at the plate during the Phils’ June swoon. The 23 year old Dominican third baseman reached a season low .235 average during that series in Minnesota and has been on the same tear his team has been on since. He’s raised his average 24 points in that time to .269 and has been red hot in July while riding a still active 10 game hitting streak that has him with a ridiculous slash line of .450/.476/.875 for the month of July. Too much of this look from Aaron Nola. As for the Phillies most important pitcher, that’s another story. Aaron Nola has been the definition of awful for over a month now. After lowering his ERA to 2.65 with 6 shut out innings in Milwaukee on June 5th, Nola failed to finish the 4th inning for four straight starts. This hurts. Nola was looking like every bit the ace we’re hoping he can become through his first 12 starts of the season, but he has lost the pinpoint accuracy he is generally able pitch with and he was/is in danger of being sent down to the minors. In his last start before the break he gave up 5 runs in the second inning to the Royals and it looked like another very short outing was in store for the struggling 23 year old. He was able to pull it together and finish 5 innings without giving up another run and the hope is that an extended break, Mackanin skipped his start during the last series in Colorado, will clear his head and allow him to regain his All-Star caliber play from the first two months of the season. With Nola struggling the staff has two pleasant surprises on it in Jerad Eichoff and Vince Velasquez. As noted before, Eichoff was acquired in the Cole Hamels deal and Velasquez in the Ken Giles transaction. Eichoff has been the most consistent starter on the staff and had his ERA down to 3.30 after winning 5 of 6 decisions before struggling in the thin air at Coors Field and giving up a by far season high 8 earned runs in Denver. Velasquez has returned from a brief stint on the DL and essentially picked up where he left off. In his three most recent starts he’s allowed the following run totals: 0, 2, 2 and has picked up the win in all three games. His record stands at 8-2 and his ERA is an impressive 3.32, leading all Phils starters. The most seasoned starter on the staff, Jeremy Hellickson, has been a solid calming presence and given himself some trade value with dependable start after dependable start through the first half of the season. I’d me remiss if I did not mention the play of the Phils’ lone All-Star Odubel Herrera. Odoobs is the new Shane Victorino (unfortunately without the arm). He is the guy on the team that other fans definitely do not like. He’s flashy and cocky. He is starting to hit for more power and already has 10 home runs this year after hitting only 8 all of last season. His average has finally dipped below .300 and sits at .294 after a rough weekend in Colorado for him. He will make bonehead mistakes in the field and on the bases but the 24 year old "El Torito" from Venezuela clearly plays with a youthful exuberance that has been missing from the stagnant Phillies for too long. He may lead the NL in bat flips as he likes to celebrate the home runs he hits. Ryan Howard is literally and statistically the worst player in Major League Baseball. It’s sad and depressing but that’s all I can say about that for now. At least he is not playing much at all these days as he provides negative value whenever he does. He is second on the team in homers with 12. That's all he can do at even close to a Major League level. My prediction for the rest of the season is that the Phils continue their Jekyll and Hyde ways. They don’t have the talent to sustain the offensive success but they have some arms and some bats that should make them a competitive squad when things are falling right. It’d be hard to imagine the offense of the past three weeks continuing but if it falls back just some it would still be much better than the lack of anything during the 6-26 stretch. I believe the Phillies will finish the season with 74 wins and Maikel Franco will hit 33 home runs. It should be fun to watch this group continue to grow and even more fun when the talent in the minor leagues joins the big league club. Cole Hamels - Cole was an All-Star for the first place Rangers and is their staff ace. His ERA was down to 2.60 but he's had two straight rough outings and he is now at 9-2 with a 3.21 ERA with 109 strikeouts in 112 innings. Chase Utley - Leading off and playing 2nd everyday for the Wild Card leading Dodgers. Chase had 6 hits in a 14 inning game two weeks ago. 6 hits! He's hitting .263 with 5 homers and 27 RBI. Jayson Werth - Werth bats second and plays left for the first place Nats. The Bearded One came on in June after a slow start and is hitting .252 with 10 home runs and 40 RBI. Jimmy Rollins - Designated for Assignment by the White Sox, no longer in the Major Leagues. Future looks bright lets gooo boys! I didn't waste my time reading the blog, but can I get your thoughts on the Phillies being 11.5 games out of the worst record in baseball? Do they have a shot!? I'm glad you felt leaving a comment was not wasting time, Anonymous. While the Phils may be 10.5 out of the worst record in baseball, they are 12.5 out of first and only 8 out of a wild card spot. Considering they were the worst team by a decent margin last year you have to be happy with the progress and potential the gang is showing this year. Great outing for Aaron Nola last night! Thanks for this helpful information I agree with all points you have given to us. I know you are interested in all types of gift card. Recently I share How does the eBay gift card generator works ? for more detail visit my site.